Everest Collegiate Boy’s Golf Team wins Regionals for the first time in the school’s history! Pictured from Left: Coach Dave Smith, Joey McMahon, Tyler Rozwadowski, Danny McMahon, JC James and Nick Korns. 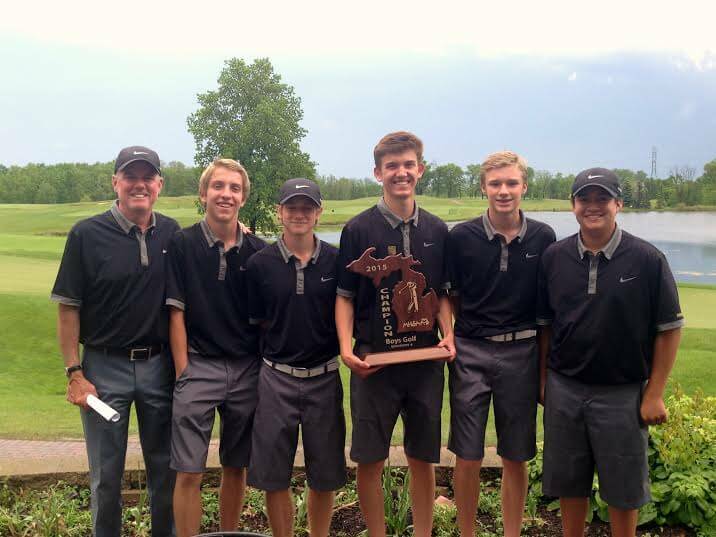 Keeping their winning streak alive, the EC Golf Team advanced to the MHSAA State Playoffs by winning their Regionals at Westwynd Golf Course on Wednesday, May 27. The boys were able to squeak out a victory by one stroke over Saginaw Nouvel to capture the Class D Regional title. The Mountaineers score of 353 was led by Junior Tyler Rozwadowski who shot a 76 and was the medalist with the lowest score of the field of players. Rounding out the rest of the score was Sophomore Joey McMahon with a 91, Freshman Nick Korns 92 and Freshman JC James 94. The Mountaineers will travel to The Meadows Golf Club at Grand Valley State University for the State Finals Friday and Saturday, June 5 and 6. → Come Cheer on the EC Baseball Team at Regionals!